*Slightly dirty from use that should wash right out. Breathe a little extra comfort into your day-to-day life with the Patagonia Women's Capilene Daily Shirt. 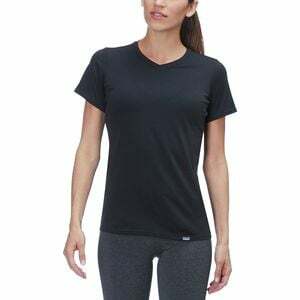 With its stretchy polyester blend and odor-resistant treatment, the Capilene is ideal for the days you sneak a quick hike in during your lunch break, or need an extra layer at your drafty office. Plus, its subtle v-neck and UPF 50+ protection mean it functions just as well on it's own on a warm day.